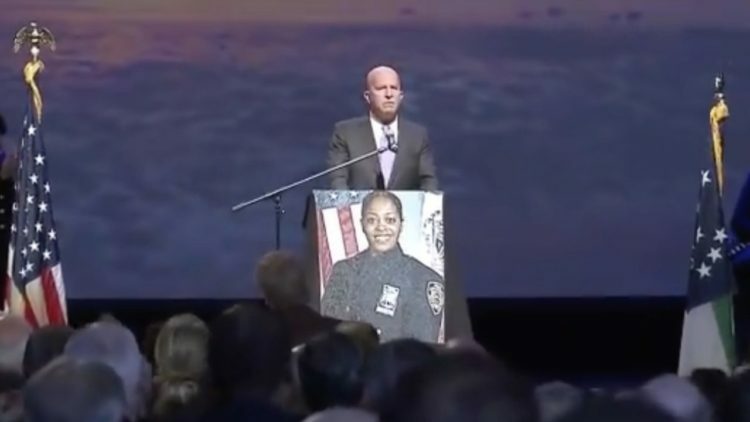 12 Jul, 2017 by	Margaret M.
This week brought us the emotional goodbye to Officer Miosotis Familia, where the NYPD’s Police Commissioner James O’Neill gave an emotional eulogy that shamed anti-police operatives, particularly Black Lives Matter. Officer Familiar, 48, was shot in the head while she sat in her mobile command unit, busy writing into her notebook. She was a 12-year veteran of the police force and leaves behind three children. So, why is Commissioner James O’Neill’s eulogy making headlines? For one, because NYC Mayor Bill De Blasio did not attend, instead spending the day at the mayoral residence, but did visit Officer Familia’s children later that day. The second reason rests entirely on his words and his condemnation of groups who are formed to cherish the lives of black Americans, unless they do not fit into their narrative. Let me tell you something,” he said. “Regular people sign up to be cops. They sign up for this job of protecting strangers, knowing there are inherent risks. But not one of us ever agreed to be murdered in an act of indefensible hate. Not one of us signed up to never return to our family or loved ones. “So, where are the demonstrations for this single mom, who cared for her elderly mother and her own three children?” he asked pointedly. The attendees gave the rhetorical question a long standing ovation. “There is anger and sorrow, but why is there no outrage? Because Miosotis was wearing a uniform? Because it was her job?” he continued. “I simply DO NOT accept that,” he proclaimed. “Miosotis was targeted, ambushed, and assassinated. She wasn’t given a chance to defend herself. That should matter to every single person who can hear my voice, in New York City and beyond.